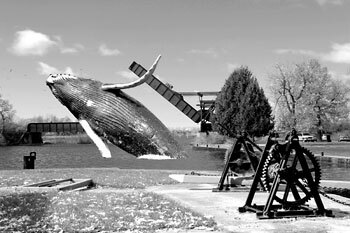 The rare sight of a humpback whale breaching in the basin just above the Smiths Falls Detached Lock. This large animal has a gentle nature and is always respectful to Rideau boaters. Three apparently unrelated events on the Rideau have a common link. In 1883, the bones of a humpback whale were found in a gravel pit just north of Smiths Falls. In 1816, Lt. Joshua Jebb paddled a canoe from the foot of Jones Falls Rapids to Upper Brewers Rapids. And today, near the top of Rock Dunder (near Morton), you can find lake bottom sediments. The common link? These all represent flooding of portions of the Rideau waterway. Let’s look at Rock Dunder. What are lake sediments doing near the top of that hill? It starts about 14,000 years ago when Rock Dunder and the rest of the Rideau countryside were about 175 m (575 ft) lower than today’s elevations – depressed by the massive weight of over a kilometre thickness of ice which formed during most recent period of continental glaciation. By 14,000 years ago, global warming had taken hold and that ice was retreating. Meltwater was filling depressions, including that of present day Lake Ontario. However, there was no exit for the lake, ice was blocking the St. Lawrence River valley. This led to a very large lake being formed, known today as Lake Iroquois. Evidence for this lake includes the sediment deposits it left behind, such as those near the top of Rock Dunder. The surficial geology maps for this region show the remnants of these deposits, on the Rideau, scattered from the shores of present day Lake Ontario north to Perth and Smiths Falls. About 13,350 years ago a channel opened up in the ice dam (near Rome, NY), rapidly draining much of the lake. At the same time, with the weight of the ice removed, the land was starting to rise (isostatic rebound). The water eventually retreated to become today’s Lake Ontario. In 1883, gravel to be used as railway ballast was being excavated from the Welsh gravel pit, about 5 km north of Smiths Falls. Workers in the pit came across several large bones. Word of these bones came to the attention of J.W. Dawson of McGill University, a geologist who specialized in this sort of thing. He collected the bones and they were later identified as being pieces of a vertebrae and a rib of a humpback whale (Megaptera novaeangliae). Later investigators found bones of beluga whales (such as those in a gravel pit at the northern edge of the Ottawa airport), marine clams and other evidence of a moderate saltwater environment that existed in this area at the end of the last ice age. This saltwater environment was the Champlain Sea, formed about 13,000 years ago as the glaciers continued their retreat over the depressed landscape. Waters from the Atlantic Ocean mixed with glacial melt-waters and river drainage to create a brackish sea which extended past (west and south) of Ottawa. The southern limit of this sea on the Rideau Canal was near Nobles Bay of Big Rideau Lake. And, at that time, beluga whales, and at least one humpback whale, were swimming over what is the Rideau River today. That same sea is also responsible for the deposition of the famous (or infamous) Leda clay – the unstable “quick clay” that underlies large areas near Ottawa (and some other parts of eastern Ontario). The last major flooding event on the Rideau was man-made. We all know that the Rideau Canal is a slackwater canal system a navigable depth of water created by flooding. Lt. Colonel John By made an engineering decision to flood rapids rather than excavating canal cuts around them, as was the canal-building norm of the day. But he wasn’t the first person to create slackwater navigation on the Rideau – that honour goes to Lemuel Haskins who did it unintentionally back in the early 1800s. Haskins was a miller who came to this area looking for a source of water power for a saw mill. He found such a spot at White Fish Falls - the location of today’s Morton Dam. It was here that the water of the White Fish River, with its head in Sand Lake, flowed over a set of rapids or falls, on its way to Lower Beverley Lake and from there to Gananoque. And so it was at White Fish Falls, sometime between 1803 and 1805, that Haskins built a dam and sawmill. A miller in those days needed a couple of things – a head of water to be able to turn his water wheel and a large volume of water to maintain that head. Haskins built his dam and watched as the water level in Morton Bay rose, forming a nice mill pond for his sawmill. But, no matter how much it rained, the water wouldn’t rise higher than about 2.1 m (7 ft) against his dam. Haskins had a leak. It turned out that the leak was in the area of today’s Whitefish Lake, then an ash tree forest. Haskins’ dam-impounded water was heading south over the Cranberry Flood Plain, through the forest and marshes, eventually meeting up with the Cataraqui River at the Round Tail (just north of Upper Brewers). The Cataraqui at that time had its headwaters in Loughborough and Dog lakes. So, at some point prior to 1816, he built a second dam, this one at the Round Tail, a rocky constriction ideal for dam construction. With the construction of the Round Tail dam, Haskins now had an extremely large millpond, stretching over 18 kilometres, from the area of Dog Lake in the south all the way up to Jones Falls in the north. When Lt. Joshua Jebb did his survey of the Rideau in 1816, he noted both dams and the fact that they provided navigation over an area that was previously unnavigable. To directly quote Jebb’s July 14, 1816 report: “The dam at this mill [Haskins' White Fish Falls dam] secures the communication with Cranberry Lake by overflowing what would otherwise be an extensive swamp to the depth of 7 or 8 feet and water is furnished by an ample stream which comes from the Chain of Lakes [Sand, Opinicon, Clear, Newboro] forming the other communication I alluded to [navigation route via the Rideau lakes] and may be properly considered the main branch of the Gananoqui river. The Cranberry Marsh is rendered passable by a dam at the entrance or head [Round Tail] of Kingston mill stream [Cataraqui River] which throws the water coming from the Loughbro Lake on to it, and overflowing it to the depth of 6 feet." Colonel By clearly saw the superiority of navigation by inundation – it appears that when he arrived in Canada in 1826, he was already forming plans to build the entire Rideau as a slackwater system. He had Jebb’s and Clowes’ reports in hand and Samuel Clowes accompanied him on his first trip along the Rideau – which would have included paddling over land created navigable by flooding. And so, in 1831 the final flooding event on the Rideau occurred as the dams at each lockstation were completed, drowning rapids, turning rivers into lakes and forming the landscape we see today. Dear Friends, I hope you had a good, relaxing summer. It has been an active period for members of the Friends’ Board of Directors since the annual meeting in May. You will find elsewhere in this newsletter the report on the annual meeting, let me just say it was a pleasure to see many of you at the meeting in the Rideau Canal Museum on May 14. Early in the summer, as part of our commitment to the development of heritage preservation expertise, Friends funded a bursary for a student to attend the Ontario Heritage Conference in Cobourg. Friends also sponsored the Paddle On for Soldier On canoe trip from Kingston to Ottawa by retired Canadian Forces members Marc Belanger and Robert Mullan. 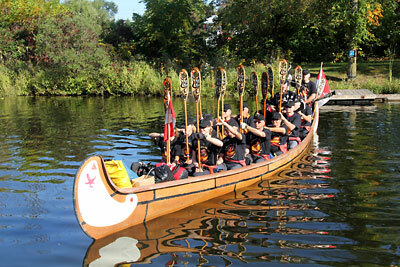 The aim of this expedition was to raise awareness about the situation of ill and injured Canadian military personnel. Friends provided a set of navigation charts of the Waterway as support for this initiative. The summer was a busy one, with the Depot opening a few days late because of the need to do repairs to the floor of the main room and to replace the toilets. Thank you to our landlord, Parks Canada, for this work, which means the Depot is safe for several more years. Sean Fairservice from Smiths Falls staffed the Depot for July and August, with invaluable support from Ashley, on loan from Parks Canada, for two days a week. Though we saw good numbers of visitors this summer, overall, sales were down and donations were less than in previous years. In July and August several members of the Board took part in cruises along sections of the Rideau Waterway with representatives of Parks Canada Rideau Canal Office and members of the Steering Committee for the Rideau Corridor Landscape Strategy. These cruises allowed the participants to view sections of the Waterway together and discuss the challenges faced by municipal planners and by Parks Canada in protecting key heritage landscapes. We all remember the comments regarding protection of landscape visual values made by ICOMOS/UNESCO in 2007 when the Rideau received its World Heritage Site designation, and we haven’t forgotten the report Canada must submit in 2012 on what it has done in this respect. So we hope that the comments made by Friends on the cruises will have an impact. In July we (Friends), wrote to Peter Kent, the Minister responsible for Parks Canada, urging him to protect the budget of Parks Canada agency. We used several specific examples of the impact of budget cuts on the Rideau Canal operation and administration, notably the closing of access to the industrial complex in Merrickville due to a shortage of funds to stabilize the structures and protect visitors. We are concerned that the true impact of budget cuts will only become known over several years and that Parks Canada may be driven to economize in ways that could put Canada’s heritage at risk. Next year, 2012, may find us scrambling to protect our priceless heritage at a time when, with the commemo-ration of the war of 1812-14, there are many reasons to celebrate the genius and commitment of the people who built our cherished Rideau Canal. Friends of the Rideau’s Annual General Meeting took place on May 14, 2011, in the theatre of the Rideau Canal Museum in Smiths Falls. Members and friends started gathering just after 9 a.m. to enjoy coffee, cake and much friendly discussion about everybody’s favourite subject – the Rideau Waterway System. Chair Hunter McGill called the meeting to order at 10 a.m. and during a short business meeting the directors for the period 2011 - 2013 were elected. Rowena Cooper, Cheryl Gulseth, Brian Osborne and Jo MacFadden were re-elected and new member of the Board, Mary Lyons, was welcomed. These five will serve together with existing directors Ed Bebee, Dave Brett, Mark King and Ken Watson, to co-ordinate the activities of Friends of the Rideau for the next year. Following the review of the Financial Statement (which marked the end of the business part of the meeting), Hunter McGill introduced our speaker, Dr. Christina Cameron. Dr. Cameron holds the Canada Research Chair on Built Heritage. She is a professor at the School of Architecture at the Université de Montréal. She previously served as Director General of National Historic Sites for Parks Canada and as Secretary to the Historic Sites and Monuments Board of Canada. Dr. Cameron’s wide-ranging talk included an overview of UNESCO World Heritage Sites since the first sites were designated in 1978. She told us that early selections included sites of high style and antiquity that were mostly European and Christian. By the 1980s the UNESCO Board recognized that there were imbalances and greater effort was made to make the list more representative of the World. A World Heritage Global Strategy meeting was held in 1994 where it was decided to forget about high style and look at sites that are common to people all over the world, such as transportation corridors. Also in 1994, a UNESCO meeting was held at Chaffeys Locks, and from that meeting came World Heritage Operational Guidelines. Based on that meeting, UNESCO looked at Canals from different standpoints: authenticity, design, materials, workmanship and setting. And, following the Nara Conference on Authenticity, including cultural diversity, diversity of heritage places and relativity of values as evaluation items. Dr. Cameron also pointed out the challenges of conserving and managing canals. She used as an example the Grand Canal in China, which is 2,500 years old and 1,800 kilometres long. The Grand Canal runs through 43 towns and historic places and because of its extreme length serves to help unify the country. Dr. Cameron concluded her lecture with a question. She wondered if the boaters and visitors to the Rideau get the message as to why the Waterway was designated as a UNESCO World Heritage Site. She emphasized the need for coordination of management and community engagement. For many people, fall is “back to school” time. For Parks Canada, it is a time to reflect on the season past and to plan for the seasons ahead. Although wet weather in the spring hampered opening the full length of the canal on time, the summer saw many calm days of sunshine that set the stage for Parks Canada to engage new Canadians and urban youth to experience the Rideau Canal in fun and innovative ways. As part of our year-long Parks Canada Centennial celebrations, we ran a spectacular “Learn to Camp” program at Long Island Lockstation in Manotick. Aimed at introducing new Canadians to an authentic Canadian camping experience, families originally from El Salvador, Cuba, Cameroon, Bangladesh, Egypt, Kazakhstan and China gathered for typical Canadian camping activities. Led by Parks Canada and our partners at Mountain Equipment Co-op, participants of all ages enjoyed this pilot project event, making it a great success. June was a particularly busy month for Parks Canada, as we had the privilege of introducing twenty-five young Aboriginal leadership cadets and their commanding officers, from the Royal Military College in Kingston, to the Rideau Canal. Every year, as part of the Aboriginal Leadership Opportunity Year (ALOY) program, the cadets wrap up their studies by participating in exercises along the canal. This year Parks Canada shared presentations with the cadets on the historic relevance of the canal, species at risk information and general leadership opportunities available to youth within the organization. Later on in the month, Parks Canada’s new national Xplorers children’s program was launched. Designed to engage young children and their families in fun exploration activities centered around Parks Canada and the Rideau Canal, the Xplorers program, available at Ottawa Locks and implemented by our summer students, was a very fun and interactive initiative that facilitated connecting kids to the canal. Throughout the summer Resource Conservation staff continued to survey sections of the canal for species at risk which include turtles, snakes and wetland birds. The multi-year survey continues to improve the available knowledge of important natural resource features on the canal. Parks Canada has also been investing to meet the needs of Canadians who are discovering and enjoying the natural and cultural heritage of the canal. This year alone, Parks Canada has invested $2.4 million dollars in the preservation of our Rideau Canal assets; and you may have noticed that a number of Rideau Canal lock stations now host new docks that lie low in the water, improving the visitor experience and ease of use for the hundreds of canoeists/kayakers who are discovering this great low impact method of enjoying the canal. All in all, it was a good summer on the Rideau Canal and the quality of experiences available along its length are improving. Parks Canada was pleased to once again support the Rideau Canal Festival, which continues to draw thousands of visitors to the Rideau Canal, sharing with visitors from home and abroad the importance of this World Heritage site. As part of the celebrations marking World Heritage Day this year, Parks Canada was honoured with a special award recognizing our dedication to preserving the Rideau Canal for future generations. As you can see, the Rideau Canal is a great public resource and Parks Canada is looking to the future as we improve and evolve the programs and services we offer to fit the changing expectations and increasing demands of a diverse and enthusiastic Canadian public. As always, I would like to thank the Friends of the Rideau for your continued support as the Rideau Canal evolves and adapts to the never-ending challenges that come our way. Boat traffic through the locks to the end of August was down 12% when compared to the same period last year. Moorings were down 6% when compared to 2010. The Rideau Waterway is enjoyed by local residents, boaters and visitors from afar. All of these people choose to enjoy the waterway in a manner that is personally pleasing. For some, it includes tranquil moments relaxing on shore and for some it’s a casual paddle, an exhilarating water sport or transiting the system in their summer residence. Ideally everyone should be able to experience the waterway in the manner of their choice without interference. Most of the time, this is the case, however, sometimes issues can arise that require attention and possibly intervention. Prompted by concerns expressed by shoreline residents and boaters, two such issues have been the subject of discussion and, as a result, action. One of these issues is the risk to public safety and the threat to shoreline habitat (and its inhabitants), caused by excessive wake. Parks Canada has been creating and distributing information along the entire waterway on this subject in the form of brochures, banners and key chains as well as during personal interactions between staff and visitors, to try to raise awareness of the problems that can be caused by excessive wake. A few years ago, however, it was recognized that a more detailed assessment of the problem was necessary and the northern section of the waterway was chosen as the area in which to begin. As such, during 2009 and 2010, a thorough assessment of the area between Hogs Back and 416 Bridge was undertaken, which resulted in numerous recommendations. These recommendations include such things as more extensive education, additional signs to more clearly delineate the existing “no wake” zones, and the creation of some new “no wake” zones. As a result, four new “no wake” zones were established in 2011 and two more are currently under review. As well, Parks Canada Park Wardens now augment enforcement resources on the waterway and have been actively patrolling with the Ottawa Police marine units. We are inviting people who are interested in this assessment and subsequent actions, to attend a public meeting on November 8, 2011 at 6:30 p.m. at the Rideau Valley Conservation Authority in Manotick. Although excessive wake can be a very complicated subject (with scientific terms and complicated definitions), problems with wake could be drastically reduced, if not eliminated, if all boat operators would look behind them to see what kind of wake they are producing and care about how it is impacting others and the shoreline. The second issue that has drawn attention is the installation of unauthorized private mooring buoys. There are a number of private mooring buoys that do not conform to current policy or regulations. The buoys in question are the cause of conflict along the waterway and in some cases they create a risk to the natural environment (i.e. their location and placement was never checked against the species/habitat information). Parks Canada has begun informing the public through media outlets that a permit from Parks Canada is required for a private mooring buoy and the terms under which a permit would (or would not) be issued. Our hope is that by sharing this information, additional unauthorized private mooring buoys will not be installed, and those that have not been properly approved will be removed by their owners. For more information on the new “no wake” zones in the Northern Sector of the waterway, or on private mooring buoy regulations and permits, visit our web site, or if you have comments or questions, please contact me directly at maryann.stienberg@pc.gc.ca. The information bulletins are online at www.pc.gc.ca/eng/lhn-nhs/on/rideau/visit/visit9/sillage-wake.aspx for no wake zones in the north and www.pc.gc.ca/eng/lhn-nhs/on/rideau/plan/bouees-buoys.aspx for the private mooring buoys. On September 25, a group of voyageurs, some fifteen alumni of the Royal Military College of Canada (RMC), presented a cheque in the amount of $1,070 as a donation to Friends of the Rideau. They made a generous donation to the Rideau Roundtable at the same time. The Rideau Roundtable had the musical group, Fiddlers Plus, to entertain the crowd. The RMC paddlers had their own musician - General John de Chastelain with his bagpipes. We had The Depot open (including, most importantly, the washrooms). The RMC alumni have been doing this trip every few years, raising money for RMC’s Danny McLeod Athletics Endowment Fund. In thanks for their donation to Friends, we gave the group a copy of Ed Bebee’s book Invisible Army and Ken Watson’s book Tales of the Rideau for their reading enjoyment. Hats off to Carleton University for initiating not one, but two Rideau digital projects. The first is a project funded by the Department of Canadian Heritage’s Canada Interactive Fund. It is the development of a smartphone application that will allow an “Augmented Reality" view of the Rideau, allowing the user to view heritage images, audio, text and other information based on their location on the Rideau Canal. The project is being managed by James Opp, Co-Director of the Centre for Public History, and Anthony Whitehead, Director of the School of Information Technology. FoR director Ken Watson is providing assistance to this group and met with James Opp and his team this summer. The second digital project is one titled “Heritage Passages: Bytown and the Rideau Canal” an on-line exhibit of the Ottawa Locks being developed by Carleton University in partnership with the Virtual Museum of Canada (VMC), an initiative of the Department of Canadian Heritage. The VMC has provided a $273,000 grant for this project. The project will use archival material from Carleton University library’s Archives and Research Collections (ARC) and Ottawa's Bytown Museum. These will be used to create a web-based tour of the locks and associated buildings. In addition, people will be able to use the smartphone application, StoryTrek, developed at Carleton, to access this information on-site. These innovative digital projects should attract a new audience to learn more about the rich heritage of the Rideau Canal. This spring marked the completion of the digitization of our ninth book on CD - the Parks Canada manuscript report “Industries and Industrialists of Merrickville, 1792-1979” by Richard Tatley, 1979. Given the length of time and amount of volunteer work it takes to complete each one of the books on CD, this is quite an accomplishment. There are two more reports being digitized at the moment; The Second Tay Canal in the Rideau Corridor, 1880-1940 and Commercial Navigation on the Rideau Canal, 1832-1961. With luck, we’ll have those completed sometime this winter. For those who watch the waters of the Rideau it’s been an interesting adventure with the coming of the zebra mussels in the late 1990s and early 2000s. Those tiny molluscs exploded in their millions along the Rideau. The immediate effect was an improvement in water clarity. The clarity (measured by secchi disk) of the water in Sand Lake for instance jumped over 20% between 2000 (no zebras) and 2001 (millions of zebras). The improved water clarity allowed light to penetrate deeper into the water and bottom rooted aquatic plants were now found growing in deeper water. Another ecological shift was the extended growth season of the “green blobs” (filamentous algae) as the zebra mussels took care of their competition (single algae). The zebra’s nutrient-rich waste helped to fertilize additional near shore aquatic growth. And there are likely dozens of other ecological changes that we can attribute directly to effects from zebra mussels. Over the last few years zebra mussel populations have declined from their initial peaks and anecdotal (non-scientific) evidence appears to show levels of zebras this year lower than ever before. That decline appears to be reflected in this year’s water clarity, which, in Sand Lake, has returned to pre-zebra mussel norms. Are we done with zebra mussels? - likely not, they are here to stay. But, hopefully this decline in population will be permanent. Time will tell. 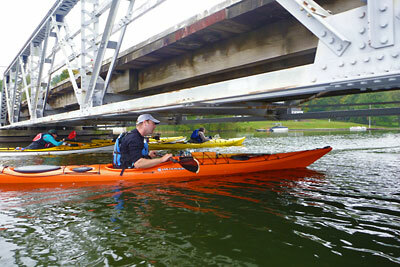 Kayakers and canoeists can usually slip under most bridges on the Rideau. Here we see part of a group doing a fundraiser on the Rideau in support of Frontenac Arch Paddling Trails (with trip interpretation provided by your editor). While overall boating was down on the Rideau this year, paddling was up with more and more paddlers discovering the rich experience of exploring the Rideau Canal. The Rideau is an ideal place to paddle – most of the lockstations allow camping for those arriving by boat (no reservations required) and those wishing a more genteel trip can stay at local B&Bs, resorts or hotels. Friends of the Rideau has been helping to encourage this healthy activity by making the new paddling guides, created by Friend’s director Ken Watson, freely available on our website. These guides provide a great resource for the paddler (or in fact any boater). In addition to detailed maps and paddling information, the guides include a great deal of information about the Rideau’s cultural and natural heritage. Parks Canada installed new floating docks this year, specifically designed with the paddler in mind (in fact restricted to use by paddlers only). In addition, they have installed new signage that marks the portage routes at each lockstation. The paddling guides provide a fantastic trip planning and on-water resource. The new paddling docks make it very easy to get kayaks and canoes in and out of the water. And, back to that genteel paddling crowd (the ones staying at B&Bs and resorts), the locks eliminate the need to do any heavy lifting (no portaging required - just float from one level to the next). It’s hard to beat paddling on the Rideau.